1 Mile Power Walk And Join our #5MileChallenge! Add more steps to your day and get fit walking the pounds away! 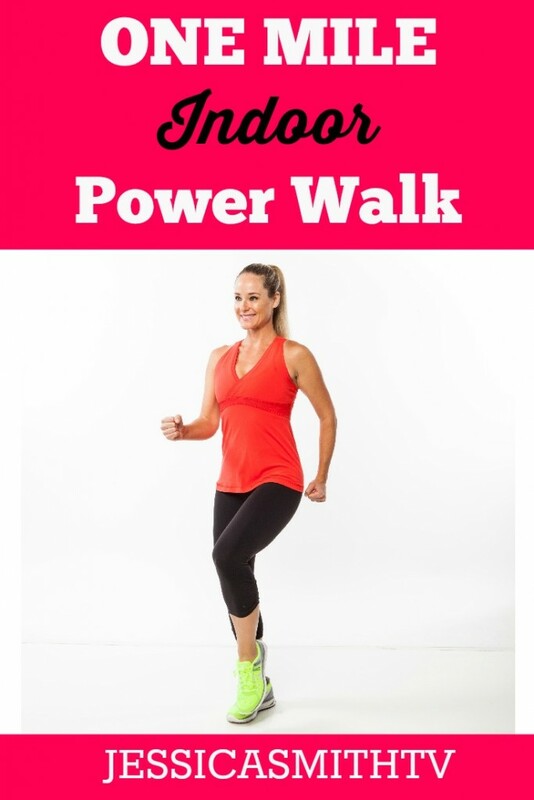 This one mile power indoor walking workout will help you stick with your walking routine no matter what the weather is like outside. We’ll also help you prevent joint strain by mixing up your moves while you walk in a small space. Get ready to power things up for this mile — be ready to start walking at a brisk pace once you hit play. Did you walk with us? Leave me a comment below and let me know! What a real nice workout to end the day! Took my stepcount 2,00 steps up! loved this workout, all the new ones are great! Thanks so much Jessica. PS I love your workout clothes, especially in this 1 mile walk, can you tell us the brand of workout pants you wear? Thanks for this great 1 Mile Blast to help me reach my 5 Mile Goal for the day. l I love this and I hope you make more for the 5 Mile Challenge, even though I do absolutely love your new 5 Fat Burning Mile Walk Digital download! Enjoyed this 1 mile quick walk after completing your 30 minute kickboxing video. Your challenges truly keep me going. Thank you for another great workout video. Looking forward to the 5 mile challenge.